In recent years, moduli of Riemann surfaces (or algebraic curves) have come to play an increasingly central role in several fields of mathematics, including algebraic and complex geometry, topology, Teichmuller dynamics, mathematical physics, and even graph theory. But the very breadth of these applications has made it hard for students to develop a broad vision of the area. The purpose of this workshop is to introduce students to the moduli theory of Riemann surfaces simultaneously from the viewpoints of algebraic geometry, topology and Teichmuller theory. The workshop will run for two weeks. The first will feature introductory lectures on the construction of the moduli space, both by using algebro-geometric techniques and via Teichmuller theory. In addition, two shorter courses will discuss concretely the moduli of n points on P^1, and the combinatorial perspective of tropical geometry. The second week will come closer to current research topics, including the birational geometry of the moduli space, the topology of surface bundles, and Teichmuller dynamics. 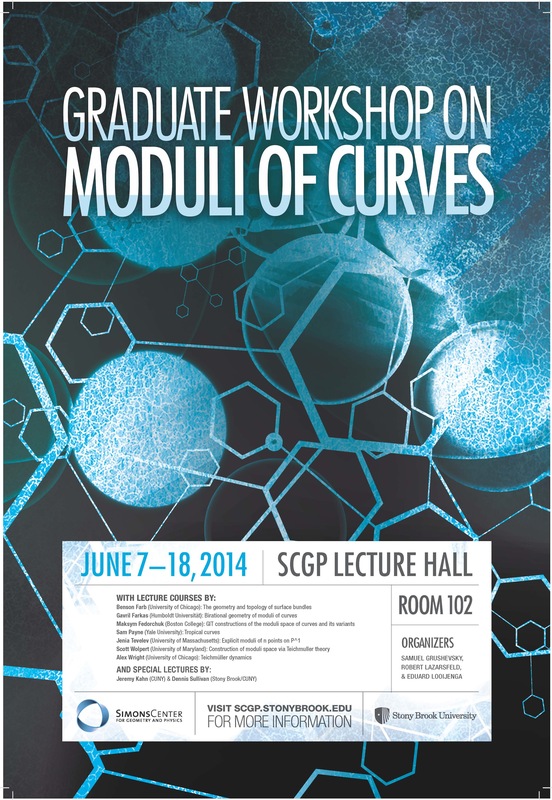 Throughout the workshop, there will be a few one-time lectures on related developments. All workshop talks and problem sessions will be held in the Simons Center Lecture Hall (Room 102). Tea time will either be in the Simons Center Lobby or on the patio outside of the Art Gallery (weather permitting). Wednesdays, July 9th and 16th, are free afternoon days.